I was hoping to get this finished to coincide with the release of Dance with Dragons yesterday... alas paint drying time had a little something to say about that. For those who aren't familiar with the name, she is a character from the very popular Song of Fire and Ice books. 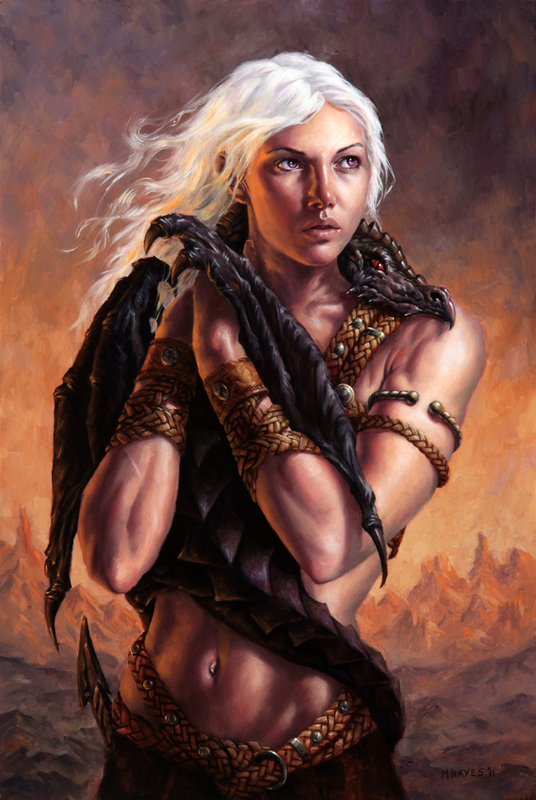 Although I think Emilia Clarke is doing an outstanding job portraying her in the HBO series, I opted to paint my interpretation of Dany from the books. I will have this painting on display at San Diego Comic-Con next week. If you are planning on attending please stop by artist alley table FF06 and say hi. Original is 12" by 18" oil paper on board. Just beautiful Mike! Wish I were attending SDCC to see this in person! Have a great show. This is beautiful work. Thank you. Lovely piece. Makes me remember the dragons of Pern and the soul connection between human and dragon..... as one. Nice art work! It is more like the book, but shes still looking older than she should be! Wow, I love her face, both girly and fierce. Gorgeous painting!